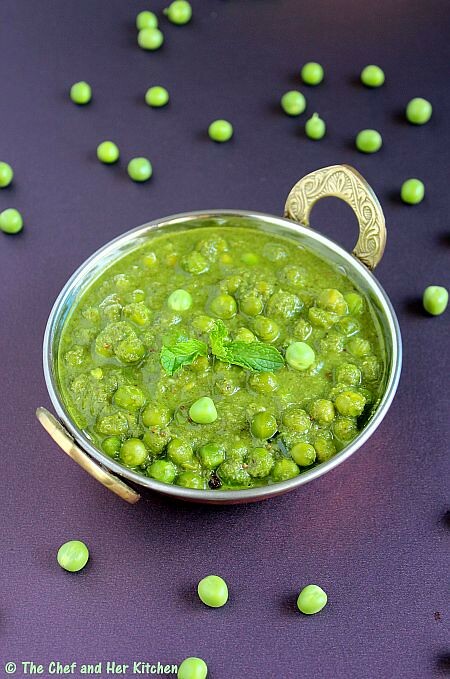 Fresh Peas are abundantly available in the markets these days and I am preparing lots of recipes using fresh peas like dry curries,tikkis,as a stuffing in parathas and various gravies. 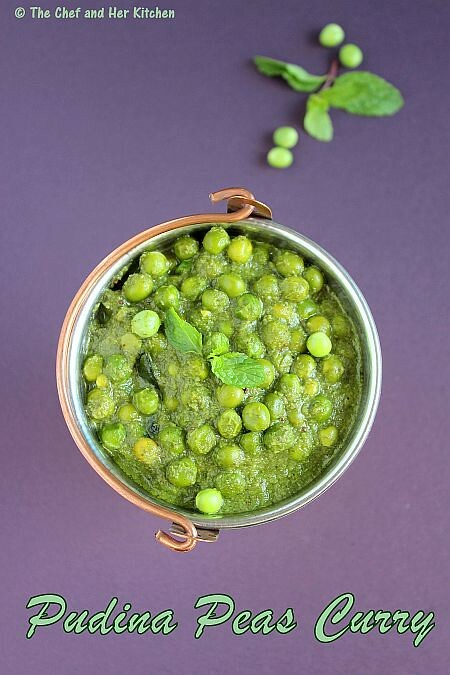 I have tasted this Pudina Peas Gravy for the first time at my aunt's place long back during one of my visits to Bangalore and it was definitely a winner recipe for me.I still remember the taste of the curry which was really refreshing and a very delicious gravy.This is a typical south Indian gravy which is really delicious and is well balanced with the sweet fresh peas spiced up in the aromatic mint gravy.It is also a perfect recipe to make on any day as the recipe does not call for any onions and garlic.There are no masalas added in the recipe too,But I do add a few cloves and cinnamon in the tempering which is optional.In Kannada this Pudina Peas gravy is called 'Hasi Batani Kaalu Gojju' where 'Hasi Batani Kaalu' stands for 'Fresh Peas' and 'Gojju' is typically a South Indian style 'Gravy'. 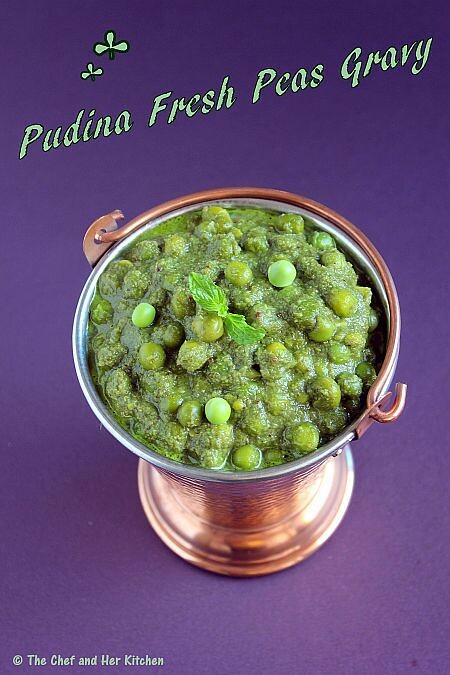 If you get hold of fresh peas,I would strongly recommend you to try this at least once as this is one of my favorite gravies and also use only fresh green peas for this,do not use frozen or dried variety for this.I would suggest you to try this Pudina Peas gravy with triangular folded chapatis like the south Indian way (where oil is applied in the inner layers and folded and rolled to a triangular chapati) instead of rotis as they pair up extremely well with the chapatis. Microwave the fresh green peas for 3-4 mins with a pinch of sugar.This will make sure the peas retain their green color through out the cooking process.Drain and keep them aside. Heat a tsp of oil in a pan and add green chillies and saute until you see some blisters forming on them. Grind mint leaves with coriander leaves,grated coconut,fried gram and fried green chillies to a smooth paste.Open the jar and keep otherwise you will loose the green color if it is closed for long. Heat the remaining oil in the kadai and crackle mustard seeds and add cinnamon and cloves and let them splutter. Add curry leaves and boiled and drained fresh green peas and fry for 2-3 minutes. Add ground mint masala and fry the masala for 5-6 mins until the oil leaves the edges and the raw smell disappears. Add 1 cup of water and salt to it and mix well and let it simmer for another 5 mins.You can cover it with lid slightly so that the gravy does not splutter outside.Do not cover the kadai/pan completely with the lid otherwise you will loose the lovely green color of the gravy. Switch off the flame and add lemon juice to it and mix well. Serve it hot with triangular Chapati/Parotta/Rotis or even Jeera rice. The addition of cinnamon and cloves is optional,in general we do not add it but its your wish to add it or not. You can add a small piece of ginger while grinding the mint paste. easy and delicious recipe. nice. nicely done...wonderful combo...looks very yum..
gorgeous greennn color.. nice variation..
such a fresh green color. am going to try making this curry. Wow, I love how this reads. 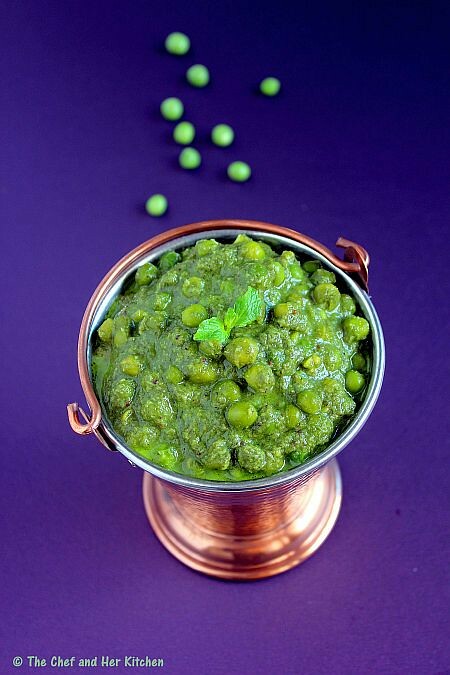 Peas and Mint is a great combo, even better as a gravy for curry dishes. Pinning this one to try later! 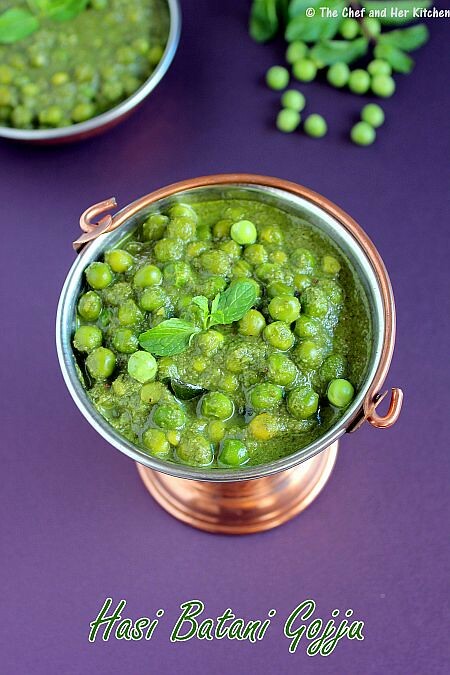 Delicious curry with peas and mints. As fresh peas are abundantly available these days,the recipe is worth trying which is very good for taste as well as health. Pratibha, you have taken so much care to presere flavour and colour in this recipe- a lovely combination. Will try tonight and let you know. I’m making Mulligatawny with naan bread today, but once that’s gone I’ll move east for Peas and Pudina and Pita bread. Funny how this time of year makes us want certain foods. I did try this couple of days back - very delicious, winner recipe.